Diesel gensets have become the major source of power for building modern infrastructures. Further, these are heavily deployed to provide prime back-up and peak power across the globe. In the United Kingdom, diesel genset are being utilized in the construction, retail and commercial sectors. Additionally, diesel genset are also used as prime and standby source of power for industrial purposes especially in the manufacturing sector. According to 6Wresearch, United Kingdom diesel genset market is projected to grow at a CAGR of 2.5% during 2017-23. England accounts for major portion of the diesel genset market in the United Kingdom owing to increasing construction activities, rising retail & hospitality sectors and surging investments to strive new business opportunities in the country. Though, the market declined in 2015 and would remain the same in 2016 and 2017, however, the market is likely to recover post 2017 due to clarification in business policies after Brexit. Changing government policies, establishment of IT/ITeS sector and automotive manufacturing expansion as well as growth in public infrastructure would fuel the market for diesel genset in the United Kingdom. Amongst all the applications, retail, commercial and capacity market dominates, with Short Term Operating Reserve (STOR) being the major reason behind high share of capacity market. The key players in the United Kingdom diesel genset market include- Caterpillar, Cummins, MTU Onsite Energy and Kohler SDMO. The report thoroughly covers the diesel genset market by KVA ratings, applications and countries. The report provides an unbiased and detailed analysis of the on-going trends, opportunities/high growth areas, market drivers which would help the stakeholders to device and align their market strategies according to the current and future market dynamics. • Historical Data of United Kingdom Diesel Genset Market Revenues & Volume for the Period 2015-2016. 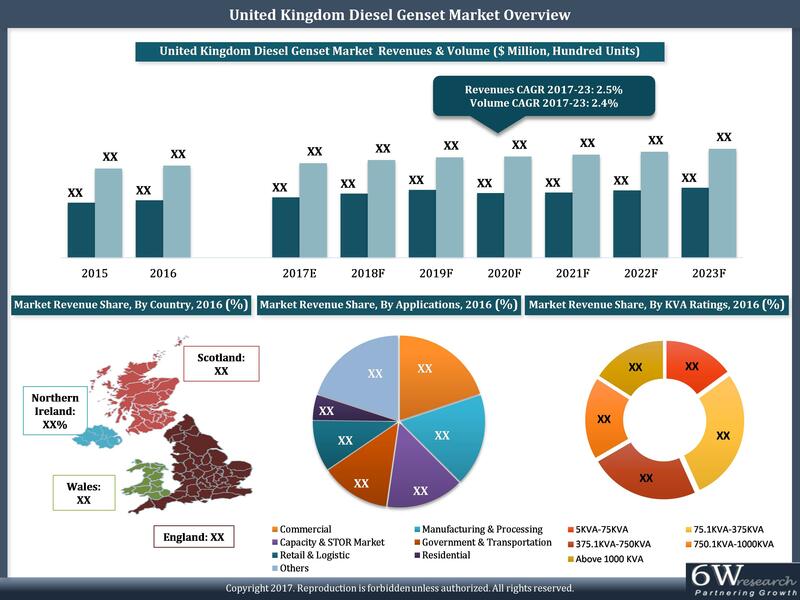 • Market Size & Forecast of United Kingdom Diesel Genset Market Revenues & Volume until 2023. • Market Size & Forecast of United Kingdom Diesel Genset Market Revenues & Volume by KVA Rating until 2023. • Market Size & Forecast of United Kingdom Diesel Genset Market Revenues & Volume by Application until 2023. • Historical Data of United Kingdom Diesel Genset Market Revenues by Region for the Period 2015-2016. • Market Size & Forecast of United Kingdom Diesel Genset Market Revenues by countries, 2016. 14.8 Atlas Copco UK Holdings Ltd.